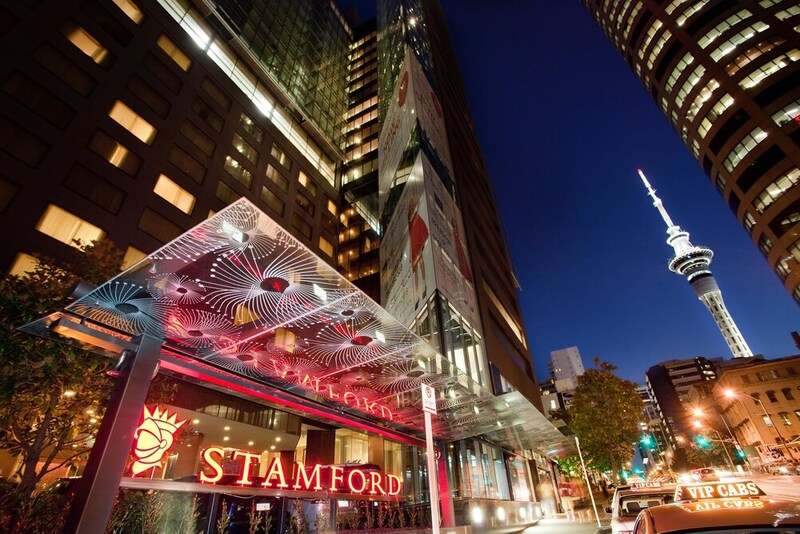 With a stay at Stamford Plaza Auckland, you'll be centrally located in Auckland, steps from DFS Galleria Auckland and within a 5-minute walk of Queen Street Shopping District. This 5-star hotel is 0.6 mi (0.9 km) from Viaduct Harbour and 0.8 mi (1.2 km) from Sky Tower. Make yourself at home in one of the 286 air-conditioned rooms featuring refrigerators and minibars. Wired and wireless Internet access is complimentary, while 40-inch LED televisions with pay movies provide entertainment. Private bathrooms with separate bathtubs and showers feature complimentary toiletries and hair dryers. Conveniences include phones, as well as safes and desks. Don't miss out on the many recreational opportunities, including an indoor pool, a spa tub, and a sauna. This hotel also features complimentary wireless Internet access, concierge services, and babysitting/childcare (surcharge). Satisfy your appetite at one of the hotel's 2 restaurants. Wrap up your day with a drink at the bar/lounge. Buffet breakfasts are available daily from 6:30 AM to 10:30 AM for a fee. Featured amenities include a business center, express check-in, and complimentary newspapers in the lobby. Planning an event in Auckland? This hotel has facilities measuring 10506 square feet (976 square meters), including conference space. Superbly located in the heart of Auckland’s CBD and situated a short walk from Queen Street and the finest dining, shopping and entertainment precincts, Stamford Plaza is truly one of the finest 5-star accommodations Auckland has to offer. Vector Arena is a 15-minute walk away and Concierge can arrange transportation services. The 10th floor pool, gym and other leisure facilities offer unrivalled views of the harbour and city, whether a leisurely swim or a serious session on the treadmill, this one-of-a-kind facility will always impress. Stamford Plaza Auckland also offers a 24-hour front desk and dry cleaning. Chinese speaking staff are available and Union Pay credit cards are accepted. Stamford Plaza Auckland has 2 in-house restaurants and a lobby bar with an extensive selection of wines, cocktails, beers and other beverages. Knights On Albert Restaurant is open for buffet breakfast (surcharges applicable), lunch and an exclusive a-la-carte dinner. Kabuki Teppanyaki Restaurant is an elegant and theatrical Japanese restaurant with interactive dining. High Tea is also available at the hotel daily from 11.30 AM – 4 PM. Stamford Plaza Auckland is a smoke-free property. Stamford Plaza Auckland has 2 restaurants serving breakfast, lunch, and dinner. Knights On Albert - Onsite restaurant. Guests can enjoy drinks at the bar. Open daily. Kabuki Teppanyaki - This restaurant specializes in Japanese cuisine and serves lunch and dinner. Open select days. For bookings of 5 rooms or more, this property charges a non-refundable 50% deposit at time of booking. For more details, please contact the property using the information on the reservation confirmation received after booking.